Lean pork tenderloin benefits from a sweet sauce like this one, especially when paired with crisp vegetables. Heat your grill to medium hot. Wash the tenderloins and pat them dry. Rub them with some peanut or vegetable oil and a pinch of salt and pepper. Set them aside. Wash and trim the asparagus spears. Toss these as well with a pinch of salt and pepper and some peanut oil. Set them aside. Cook the sushi rice according to the instructions on the package. While the rice is still warm, fluff it with a fork and transfer it to a large stainless steel bowl. Dissolve the granulated sugar and 1 teaspoon salt in the vinegar and sprinkle it over the rice, stirring with a wooden spoon to incorporate. Add the scallions and stir to incorporate. Wet your hands and press ¼ of the rice into a ¾-inch ring mold. Unmold each rice cake onto a well oiled sheet pan and brush evenly with the remaining peanut oil. Set aside. Grill each pork tenderloin to the desired temperature of about 140 degrees, about 15-18 minutes. During the last 10 minutes add the asparagus to the cool side of the grill and add the rice cakes to the grill over direct heat and cover the grill. Make sure you oil the grill before adding the rice cakes. Turn them after 5 minutes or so. Let the pork rest and slice it into medallions ½-inch thick. 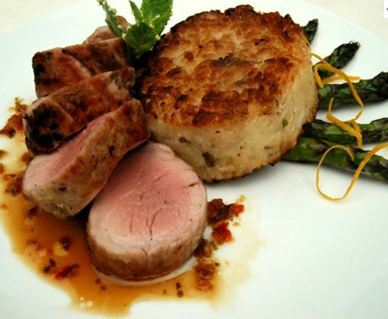 Plate the pork medallions attractively with the rice cakes and asparagus. Spoon some sweet chile sauce over the sliced pork and add the orange zest as a garnish over the asparagus. Serve immediately.